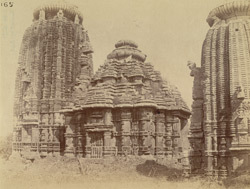 Photograph of the Chitrakarini Temple, Bhubaneshwar, from the Archaeological Survey of India Collections, taken by William Henry Cornish in 1892. This temple dates from the late 13th Century and is set in a walled compound with four smaller towered shrines. The sanctuary and the mandapa walls are decorated with sculptures. This view shows the mandapa in foreground and the sanctuary beyond.